Dining in the Danish capital is a treat. From avant garde new Nordic cuisine to classic Danish dishes like crackling pork and schnapps, there is so much to sample in Copenhagen. We’re showcasing first, the must try Danish snacks, foods and meals and second, which restaurants we recommend in the capital! Keep reading to find out all the restaurants you must try in Copenhagen and what you should order. Food in Denmark felt familiar yet different. We were so blown away at how simple fare like bread, yogurt and porridge could have so much more flavor, crunch and substance than what’s readily available in America. From hot dogs to pastries, everything tasted elevated in Copenhagen (especially the price tags). Smørrebrød (open sandwich): Think of smorrebrod as your Danish version of a sandwich or something your diet-conscious friend would order. Essentially an open faced sandwich, smørrebrød features a slice of dark brown rye bread topped with seasonal ingredients. You can try fish, meat, vegetarian – there are endless options. Grød (porridge): This is the hot breakfast of champions. Porridge in Copenhagen is traditionally made from organic grains like rye, oat or barley and then topped with fresh fruit, nuts, seeds and jams. Delicious, filling and hip! Fiskefrikadeller (fishcake): Cod is a beloved dish to the Danes, who like it with lemon juice, onions, dill and parsely alongside potatoes and veggies or fried into balls. Flæskesteg (roast pork): Roast pork is a national dish in Denmark and a food you absolutely should try if visiting Copenhagen in winter. Every Christmas dinner and Christmas food stall will serve their version of homey flæskesteg. Æbleflæsk (apple pork): Another pork dish, this one is made with bacon, apples, sugar and onion for a savory yet sweet meal. Salted pork belly is fried with apples, thyme, sugar and onion and combined in a sort of mash, which is then eaten over rugbrød bread with a side of beer! Wienerbrød (danish): We might call these pastries ‘Danishes’ but in Denmark, they’re called weinerbrod and typically only eaten on the weekends or special occasions. Pick the classic snegle (snail) pastry spiraled with cinnamon, butter and icing or try one filled with jam and custard for a sweet treat. Another great classic is brunsviger, which tastes like coffee cake. Rugbrod (rye bread): My favorite thing to eat in Denmark was the bread. It’s dense, dark and much healthier than white bread – and eaten for every single meal. Rugbrod is traditionally made from rye, is low in fat and contains no oil so it’s quite healthy! Pølse (hot dogs): New York has dirty water dogs, Copenhagen has elevated rødpølser. These skinny pork hot dogs can be boiled or grilled and are traditionally topped with all the accouterments (ketchup, mustard, pickles, crispy onions). Even more strangely, Danes traditionally eat them with chocolate milk! Next up, which Copenhagen restaurants we loved! A quick note: tipping in Copenhagen isn’t expected since service is included in the bill. Taxi drivers, waiters, bartenders, coffee baristas etc all earn a fair living wage. Just round up if you want! Michelin’s critics have awarded 18 stars across 15 restaurants in Copenhagen. While Denmark has a reputation for very high standards of living, I actually thought the Michelin and fine dining restaurants were a “good deal”. Hear me out: many of them offer prix fixe courses for lunch and dinner that are comparable to New York prices so for the quality, the relative value is much greater! On the flip side, we tried a couple humble restaurants for dinner, like a top rated ramen joint, where we spent way more on ramen than we ever would in New York, so it felt like a rip off. The only 3 star Michelin restaurant in Copenhagen, Geranium has a light, modern and dynamic kitchen. The meals are meant to stimulate all your senses! The interiors in here are stunning – lots of white, soft rugs, clean place settings. If you want to try Nordic produce at the highest level, come to this 2 Michelin star restaurant! This is a stunningly beautiful restaurant, located in an old housing block originally built for the Danish navy. With a European menu and Danish finesse, you’re in for a treat! D’Angleterre is the hallmark luxury hotel in copenhagen and its restaurant Marchal blends modernity with tradition. The menu has both Danish and French cuisines and their weekend brush is quite famous! Read our review here. This creative kitchen offers a more relaxed, casual environment. Its sustainable kitchen is focused on good food, good wine and good company! For anyone who hates frou frou, Relae is for you. Now on the flip side, here are some affordable restaurants in Copenhagen. If you’re visiting Copenhagen on a budget (I feel ya) don’t worry – there are lots of affordable yet still delicious restaurants for budget travelers. Copenhagen is so foodie friendly! Keep in mind that visiting Copenhagen on a budget means spending about $25-50 USD per person for a filling dinner. Gasoline Grill: Don’t let the ‘gas station’ exterior fool ya – this place serves up seriously good burgers. Gao Dumpling Bar: A great idea to eat well on a budget is to head to Nørrebro or the Meatpacking district, where Copenhagen has some fantastic Asian restaurants at more reasonable prices. This place serves both dumplings and Asian dishes so you can mix and share. Ban Gaw Thai: We went here after craving some Thai food and it didn’t disappoint! This place is super popular and all the dishes are authentic, lively and come in decent portions. Great service too. District Tonkin: This spot serves hearty Vietnamese street food favorites. Yum! Grød: A Danish classic, Grod serves delicious dishes in the porridge like category. While you might think of it is as a brunch only spot, they serve dinner meals too! Think risotto and daal. Royal Smushi: With pastel colored furniture and classic chandeliers, this colorful cafe is the prettiest spot to try smorrebrod! Everything is offered in miniature and shaped like sushi, hence the name. Mirabelle: a great restaurant with out-of-this-world baked goods – stop in to check out what seasonal Danish classics have been made that day! Møller Kaffe & Køkken: A fantastic breakfast spot in Copenhagen known for its seasonal small dishes. Papirøen: If you want to try Copenhagen in a unique atmosphere, head to Paper Island, a chilled out island on the eastern harbour which has a warehouse vibe. Lots of great stalls and vendors to try! WestMarket: Street food lovers should head to this market in Vesterbro, stat. There’s everything from cool coffee shops to second hand stores to specialty grocery shops and perfect after work drink spots. Sonny: A trendy spot for avocado sandwiches and great java. Opt for the Sonny Combo for a sandwich, matcha granola bowl, hot drink and Sonny juice (apple, ginger, tumeric and spirulina) for a good sampling! Atelier September: a hugely photogenic coffee shop famous for its granola, porridge and avocado toast. 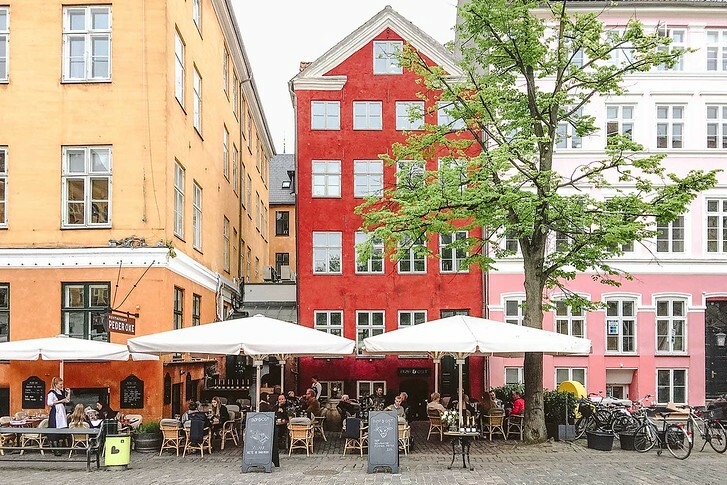 Café Det Vide Hus: A cozy coffee shop next to the King’s Garden that makes great popsicles for sightseeing and snacking on the go! Osterberg Ice Cream: specializes in fruity flavors – give avocado a try! Guilty: Pretty and delicious Parisien style desserts can be found at this patisserie. Try the gorgeous ‘love balloon’ dessert! If you have a Copenhagen restaurant you enjoyed and recommend, let me know in the comments! Why did i find this article AFTER i visited Copenhagen?! Lolz. Luckily I did visit Grod and Royal Smushi cafe, both were so good! There is a great foodscene there. Ive written some other of your recommandations down for the next time i visit Copenhagen. thanks for sharing! Hi Stephanie – haha, aw. For your next trip, check back and maybe we have some articles written to help you out! :) Glad you visited Grod and Royal Smushi, they’re both so good and the decor is amazing. Copenhagen was just named Lonely Planet’s city of the year for 2019 so always a great excuse to go back ha!